Polarity phenomena are pervasively observed in natural languages. Previous studies on Chinese polarity items are mainly in line with the non-veridicality approach. This book, however, employs the downward-entailing hypothesis as its analytical foundation, and argues that downward entailment is the only licensor for different kinds of Chinese polarity items, and non-veridicality is neither a necessary nor sufficient condition and thus offers inferior explanatory power compared with the former. To begin with, it lays the groundwork for this research by presenting a brief introduction to polarity phenomena and reviewing the existing relevant theories. Then it addresses the status of the commonly used element dou in Chinese. Specifically, it applies the tripartite structural frame to the studies of dou, and examines the role of dou in licensing the polarity items. Moreover, it investigates the properties and behavior of dou with respect to modality. Based on the analysis above, it observes that non-interrogative wh-indeterminates in Chinese can be licensed in the restriction domain of a necessity operator. Also, the non-uniformity of three Chinese polarity items, i.e., shenme, na-CL, and renhe, is scrutinized within the downward-entailing framework. This book will appeal to scholars, teachers and students in the field of linguistics, especially in the areas of formal semantics and generative grammar. Researchers and engineers in cloud computing and big data who are seeking help from linguistic contributions to meaning and logic will also benefit from it. Li Chen is an Assistant Professor in the School of Humanities, Shanghai Jiao Tong University. Her research interests lie in syntax, formal semantics and psycholinguistics. Frontiers in Applied Linguistics focuses on the development of applied linguistics in the Chinese speaking world. Although extensive researches have been carried out in the field of applied linguistics, most studies have primarily concentrated on Indo-European speakers. This series is expected to fill the void. 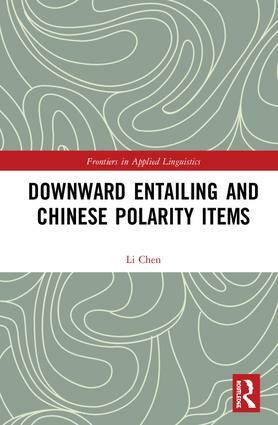 Each volume in the series will address different issues, and strike a balance between methodological and theoretical discussion on empirical researches into applied linguistics in the Chinese context. Kaibao Hu is a professor of Translation studies and dean of the School of Foreign Languages, Shanghai Jiao Tong University. His main research interests are translation studies, corpus-based translation studies and language contact. Professor Hu is the author of the Historical Text of English-Chinese Dictionaries and the Evolution of the Chinese Language (Shanghai Yiwen Press, 2005), An Introduction to Corpus-based Translation Studies (Shanghai Jiao Tong University Press, 2011), A Corpus-based Study of the Chinese-English Conference Interpreting (Foreign Language Teaching and Research Press, 2015), and Introducing Corpus-based Translation Studies (Springer, 2015), etc.